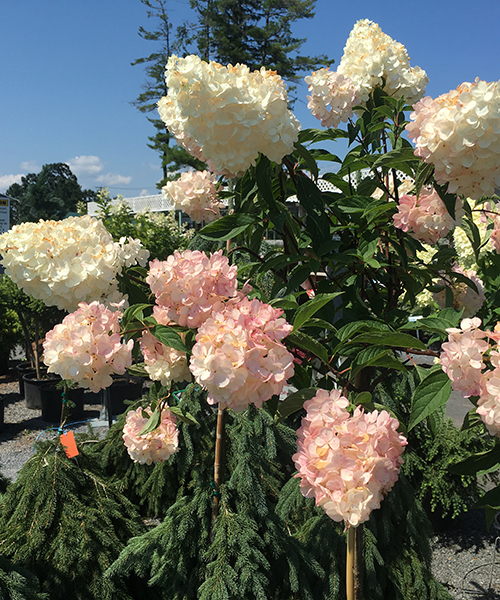 Hydrangea Paniculata – Garden Nobility | Faddegon's Nursery, Inc.
Aug 3, 2017 | Shrubs, Trees & Vines, What's New? If we had to assign the title of Garden Queen to any plant it would likely be the hydrangea paniculata. Panicled hydrangeas are nothing less than spectacular with a commanding presence in any landscape or garden. Their gigantic cone-shaped blooms take on the summer with startling beauty as well as reliability. Since all of the flower buds form in early spring, winter can’t get its frozen fingers on them. In other words, no hydrangea disappointment! Instead, you’ll see midsummer blooms that bestow their grace onto all other plants in their realm. Your garden will finally look complete. The paniculatas are hardy to zone 3 so our area is ideal for them. Easy and versatile, they are great for hedges, as small trees, in groupings, or as a specimen. They can be grown in part shade although full sun will result in better blooming. Good soil is certainly a plus for any plant, but paniculatas are not especially picky so very little in the way of maintenance is required once they take off. These hydrangeas change their own colors without the help of extra amendments. Prune in late winter for the strongest stems, feed once in the spring, and then go about your other gardening chores while your paniculata readies itself for a royal entrance! What sets it apart? The compact plant-it-anywhere size. What sets it apart? The sweet strawberry color. The enormous flower heads are a blend of vanilla and strawberry (Yum! ), held upright on red stems. The flowers emerge creamy white in mid summer, change to pink as the night temperatures drop and finally turn strawberry red. New blooms appear as older blooms change color, giving the plant a multicolored effect in late summer and early fall. ‘Vanilla Strawberry’ grows upright and then cascades later in the season abundant with flowers. Mature size: 6-7’x4-5′. Also from First Edition Plants. What sets it apart? Huge two-toned blooms all season. What sets it apart? Fast growing, long-lived, and unique color. What sets it apart? The earliest paniculata to bloom and the brilliant fall foliage. Quick Fire begins putting out gorgeous bright white blooms in June. the panicles have a lovely, lacy effect similar to Pinky Winky. The flowers age to pink and then deep, rosy red. This is a paniculata with an added bonus! The leaves turn gold and burgundy in the fall. Mature size: 6-8’x6-8’.